Meebo is a web-based instant messaging client that allows users to integrate their instant message clients into one easy-to-use web interface. Rather than chatting from the MSN, AIM or Yahoo desktop clients, Meebo allows you to chat from a lightweight Ajax interface. You can also generate Meebo widgets that allow IM interaction from web sites or blogs. 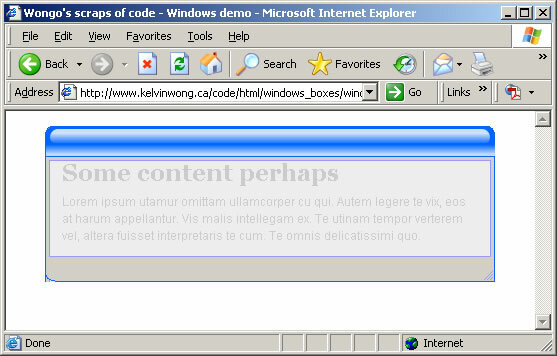 The problem is that the code generated by Meebo’s widget factory is non-valid XHTML. This can be a problem for people who build web sites that require valid HTML. The Meebo widget factory produces a Flash container based on the embed tag which is not part of the XHTML 1.0 Transitional specification. I was able to build a valid container based on the object tag which will pass automatic validation. Rather than get into the messy details, I have created a simple application that extracts the important bits of information from the embed tag and builds a new object tag. It is still kind of temperamental, but it works well as long as you don’t try to feed it bad code. Give MeeboMaker a try and let me know what you think. I created a small example showing how to use the ‘label’ HTML tag to make it easier to click radio-buttons and check-boxes. 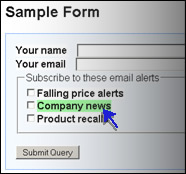 People are used to being forced to click the little tiny boxes (with little margin for error) so they may not realize if a clever web designer has implemented labels for their form controls. By clicking the label, the focus shifts to the input element without forcing the user to demonstrate superior fine-motor control.